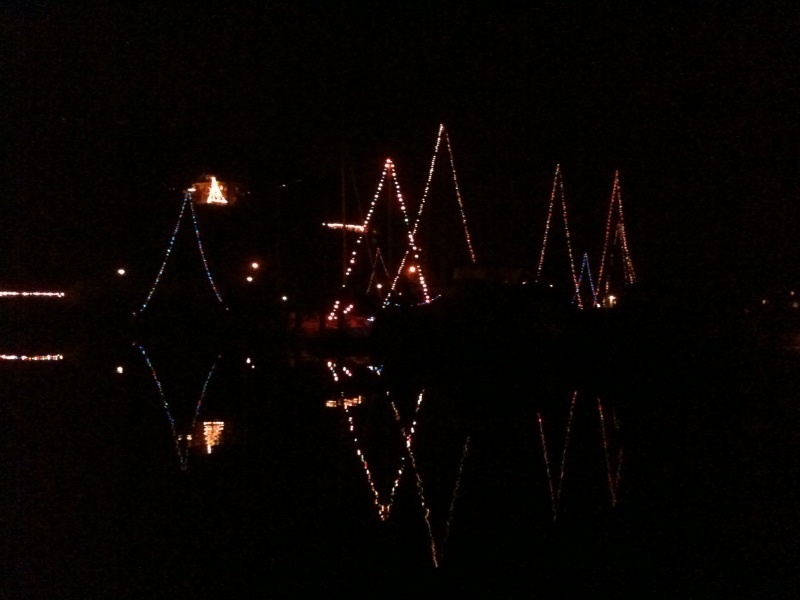 With winter’s chill upon us, one of my favorite holiday boating experiences is a night cruise to see the Christmas lights at various marinas and yacht clubs. The Friday before Christmas I coerced my friends, Glenn and Mary Beth Hall, to bundle up and take the tour of Sausalito and Belvedere with me. The Halls own a Grand Banks 32 and recently purchased a Cal 20, both which are kept in Sausalito at Clipper Yacht Harbor. Capable and enthusiastic shipmates with adventurous sides, Glenn and Mary Beth are on my go-to short list for waterborne fun. We left at sunset aboard my 1966 16′ Slickcraft with a 60HP Yamaha 4-stroke outboard, appropriately named Laughter. This was my first boat I purchased when I was 14 years old, growing up on Long Island. They say you never forget your first girl friend. Trust me, in my case it’s true because I still have her, 38 years and 3000+ miles later. Like any wonderful woman, she has cost me dearly, but to me she is priceless. Tonight we shared another special evening together. The temperature hovered in the high 40’s. Not a breath of wind distorted the reflections of the various objects above the water’s surface. As twilight enveloped us the air’s clarity intensified, sharpening the image of every single light ashore or afloat. Yes, Virginia, there is a Santa Claus I mused as the first arrays of Christmas lights began clicking on and brightening our already festive mood. 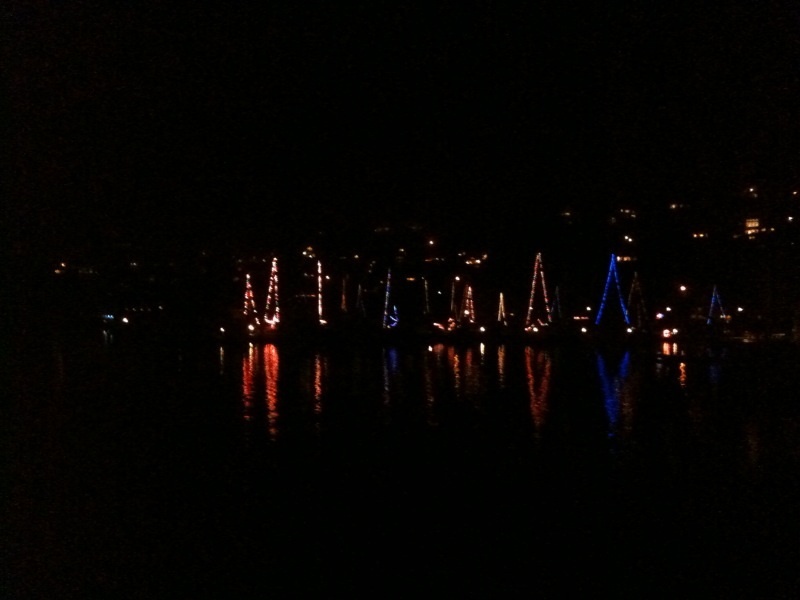 We passed through Sausalito’s various marinas as the night began its own display of brilliance. Each star wavered and danced above us on the deep black background of infinity. My thoughts went back to similar December nights some thirty years ago as my frozen fingers attempted to manipulate my sextant to achieve a star sight off the coast of eastern Long Island during a celestial navigation (aggravation) class. Once again I was engulfed by the good feelings of our winter holidays as warm memories came to mind, aided in a small part by our friends in Scotland….. Approaching Belvedere and Tiburon from Raccoon Straights, we were delighted by the colorful displays onboard the yachts at Corinthian and San Francisco Yacht Clubs. With many a Corinthian Yacht Club Friday Night Race behind me on my Ranger 23, Patience, we headed to their guest dock. Once inside the club, what to do? Sit at the beautiful bar overlooking the Christmas-lighted boats? Face the crackling fireplace? Or, position ourselves at a table in the lounge overlooking Angel Island and the city beyond? I was drawn to the boats as usual. I deeply appreciated the spirit and creativity the owners of these decorated boats displayed. We sat entranced by their thoughtfulness at the bar and toasted to their good fortune. Leaving CYC we noticed the solitary white light atop Angel Island. I mentioned this light had been extinguished during WWII but was re-lit every December 7th for the holidays in memory of those who sacrificed their lives serving our country. I gave silent thanks to those individuals and their families for allowing me this special moment. Turning towards the Bay we were stunned by the reflection of lights from the city and Golden Gate Bridge. Those lights seemed to melt together leaving no visible horizon. We were afloat on a burnished bay of gold, red and green. Looking back toward Tiburon we saw our wake was alive with moving colors. There was not another boat underway, anywhere. Next stop was Sausalito Cruising Club. After a challenging unmarked approach, we were secure beside the club’s concrete barge. The club was floated upon that barge back in 1980. I helped prep for that moment down in the bilge of the leaking original WWII vintage barge, nailing sheets of plywood to reinforce its bottom and “waterproofing” the seams with roofing tar. It worked and here we were years later, enjoying a fine meal and live music. The views of boats only added to the evening’s pleasure. Leaving the dock at low tide proved adventurous with Mary Beth operating the search light as Glenn and I tried to navigate the channel out. Laughter vibrated with an occasional tap of the prop in the mud. We called it boating by Braille many nights among the sandbars of Great South Bay. We finally arrived back at my sales dock around 9:30, somewhat chilled but clearly thrilled by our Yule tide experience. So my advice for 2012? Just do it! Take advantage of these calm, cold, clear nights afloat. Feel the evening’s bite in the air, the companionship of close friends and a splash of holiday spirit. Have a safe and Happy New Year! This entry was posted in About John Baier, Boating. Bookmark the permalink. Gorgeous! Gorgeous! Imagery and thoughts and memories…. 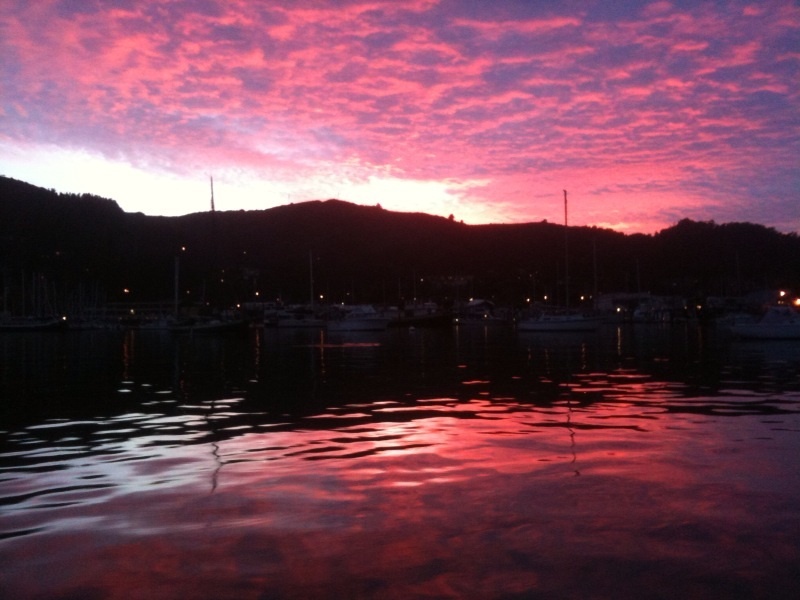 I just clicked in to read this wonderful report from Sausalito…. Thank you my friends, and a happy and beautiful New Year to you both! !